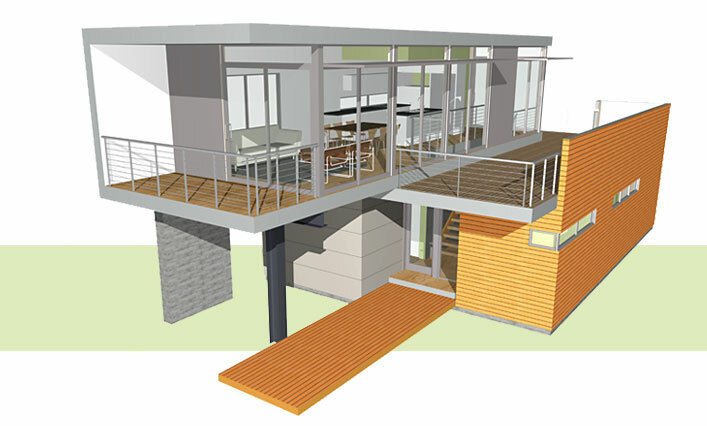 pieceHomes are green, modern, modular homes designed by Davis Studio Architecture + Design. Taking advantage of the beauty of the surrounding environment is a hallmark of the designs by Davis Studio Architecture + Design, the husband and wife design team of architect Jonathan Davis and designer Mary Jo Davis. Bringing an appreciation of, and care for, the environment is a key goal of pieceHomes. Their combination live + work residence in the Venice area of Los Angeles was designed in part as a showcase of green technologies and materials and as the pieceHomes prototype, showing clients that green, modern, and affordable can go together. The modules are built in factories and arrive at the project site complete or nearly complete, depending on the complexity of the house design. Each house is made to order in the factory so each house, even our pre-designed homes, receives individual attention and care. Periodic reviews at the factory by pieceHomes architects are part of the building process. pieceHomes are offered in three ways: our pre-designed lines of plans (Standard, Premium, extraPieces, and Multi-Family); pre-designed plans with adjustments; or custom designed houses. 1. Our pre-designed plans offer the most streamlined method of building your own pieceHomes. Select the house that best suites your property and works within the building codes of your municipality. After selecting your exterior and interior finishes, you skip the rest of the architectural design process and proceed directly to building, saving time and money. 2. If you like one of the pre-designed homes but you need another bedroom or need to make major adjustments to window and door layouts, pieceHomes architects will work with you -- for a set fee -- to adjust the pre-designed plan to fit your specific needs. 3. Or bring in your ideas for your dream home and we will design a completely custom home for you. Expect to spend a few months in the design phase. Time spent up front means you'll be happier with the end results. While the goal of pieceHomes is to provide homes as complete modules, if you are outside of our module delivery area, or in an area where module delivery is not possible, eg. narrow winding mountain roads, we can provide the homes as a hybrid of mini-modules and panelized, or entirely panelized, or the house plans can be purchased to be built using traditional on-site construction methods.